The Formation of the First Triumvirate. Marcus Licinius Crassus was one of the leading Roman businessmen and politicians in the late days of the Roman republic. He played a key role in the transformation of the Roman Republic into the Roman Empire. He amassed a lot of money and wealth during his lifetime; he is the richest man in Roman history and is considered by historians as one of the wealthiest men of all history. It may seem like Crassus is an obscure fellow compared to Pompey the Magnus and Julius Caesar. Many people who don’t know much about Roman history know the names of Pompey and Caesar, but they don’t know the name of Crassus, which is surprising considering the fact he was one of the three most influential political figures of the time and he dominated the political system behind the scenes. While it is true that Crassus is not exceptional as Pompey and Caesar, he is not an individual who should be underestimated. He went all the way to the very top in Roman politics. He served in the highest public offices of the Roman republic, namely the offices of consul and censor. He came from a prominent family. His father, P. Licinius Crassus, was an eminent senator and a distinguished general. His great, great, great-grandfather’s older brother was L. Licinius Crassus the orator (consul 95 BCE) who was the greatest Roman orator before Cicero. Although he came from a distinguished, prominent family, he lived a difficult and painful life in his early years. He grew up during a time of great political and social chaos. There was a civil war going on between General Marius and General Sulla. General Marius won the civil war against General Sulla. After capturing the city, General Marius immediately seized control of the Roman government. He then ordered the purge of all those who had supported Sulla in the civil war. Crassus’s family members had supported Sulla. In the bloodbath, Crassus’s father and one of his brothers were killed. He fled from Rome and went to Spain with three of his friends and ten servants. He hid in a seaside cave and lived in there quietly for many years. After the death of Cinna, Crassus came out of hiding and returned to Rome at a time when Sulla was in power. Crassus had gained the favor of Sulla for his heroic efforts in Sulla’s military campaigns in Italy. However he fell out of favor because of his excessive greed in purchasing real estates at knock-down prices during Sulla’s proscriptions of his political opponents. In Roman politics, Crassus enjoyed great political influence in the senate and had a considerable political following. He used his enormous wealth to provide financial support to his friends’ political campaigns. He got most of his wealth by selling property confiscated by Sulla at knocked-off prices, which brought him sensational profits. Another way he acquired his wealth was by selling off areas of land that had once been occupied by burning properties. He used his wealth to buy and maintain a troop of about 500 slaves all of whom were skilled builders. He would wait for a fire to break out and would then offer to buy the burning properties. Using his workers he would then rebuild and develop the area and draw income from rent or sell it off with a large profit. Crassus played a significant role in world history in the sense that he funded the impoverished, up and coming Julius Caesar’s political campaigns and that he took Caesar under his wings and groomed him. So Crassus was sort of like Caesar’s political mentor. Caesar had a good relationship with Crassus. They became lifelong allies. However, Crassus and Pompey disliked each other. Crassus was never really popular with the voters and he had difficulty earning the love and respect of the Roman people despite the fact that he came from a prominent, popular family because of his antisocial personality. By contrast, Pompey and Caesar were very charismatic and likeable. Crassus’s only true talent lay in amassing money and wealth. While he was a good public orator and a military commander, he was no match for Pompey and Caesar in these two spheres of activity and he struggled to live up to comparison with these exceptional individuals. And because of this reason, he was jealous of them. Crassus seems to be a greedy and very ambitious man just as Pompey and Caesar were. He always wanted power and money and military glory and he was willing to do whatever it took to acquire them. He was also an opportunistic and disloyal person. While Sulla was in power and while he was alive, Crassus pretended to be his loyal servant in order to advance his career and achieve his personal goals. But after Sulla fell from power, Crassus immediately seized the opportunity to position himself to gain political power, and when he became consul he overthrew parts of Sulla’s constitution. Crassus shared the consulship with Pompey a few times. Because the two were consuls together, they had intense rivalry. Crassus tried hard to surpass Pompey. Crassus’s passionate desire to acquire military glory that was more glorious than the one that Pompey acquired and his intense eagerness to be greater than Pompey drove him to his death at the Battle of Carrhae. Crassus was insecure about his position in the consulship. He was afraid that Pompey might become more powerful and overshadow him. So Crassus tried everything he could to control Pompey’s influence. Most of them utterly failed. One of the effective measures that Crassus took to control and limit Pompey’s growing influence was land distribution. He got a law passed through the senate which granted him the power of land distribution. When Pompey and his soldiers returned to Rome from their military campaigns in Spain, Pompey’s soldiers had to turn to Crassus for land. So they became dependent on Crassus for their wellbeing. In 73 BCE the great slave revolt led by Spartacus broke out. After the praetors Clodius, Varinius, and the consul Gellius failed to suppress the slave revolt, Crassus was given the command. During the battle, Crassus found himself caught in a situation where he had to ask the senate to send reinforcements. But he knew then that whoever then Senate sent would get the credit for defeating Spartacus and the senate sent Pompey. Crassus inflicted a crushing defeat on Spartacus’s troops and Spartacus himself was killed in the battle. Spartacus’s men fled and were captured and killed by Pompey. As Crassus had predicted, Pompey claimed the credit for putting an end to the slave revolt. Later on in his life, Crassus got the governorship of Roman Syria. He made his intention known that he was going to use it as a base of operations against the Parthia. Crassus faced considerable opposition from the senate regarding the matter because Parthia, although a long-time enemy of Rome, had never done Rome any harm. Ateius, one of the tribunes, made an unsuccessful attempt to stop Crassus from leaving Rome. 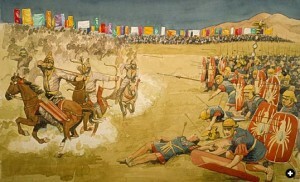 At the decisive Battle of Carrhae, the Roman army found itself surrounded by Parthian archers. Parthian archers shot them all to death with their arrows. Crassus was killed. After the death of Crassus, the first triumvirate was broken apart. The collapse of the first triumvirate was the critical juncture at which point Caesar and Pompey began to realize that one of them could actually realize their imperial dreams in the golden opportunity that they now had, gain such magnificent power that would make any Roman imperator bow down in awe, and dominate the Roman world as its sole master. Within four years of Crassus’s death, Caesar crossed the Rubicon River and started a civil war with Pompey in order to acquire this supreme power.